Jill Lepore, whose writing in the New Yorker I always enjoy, has a cute article on their website (perhaps also in the print version — I have not yet received the latest issue) listing her top 10 books of 1709. In fact, she only lists 9, reserving 10th place for Benjamin Franklin, who at the time was just three years old. According to Lepore's data (which I suspect come from the National Index of American Imprints through 1800, also known as the short-title Evans), only 31 books were printed in the British colonies in North America in 1709, and all but 3 were religious tracts printed in Boston. Her number 1 item is Daniel Leeds' Almanack, printed in New York. She does not mention another Almanack printed that year, in Boston. This one, written by Daniel Travis, has the interesting feature that some copies of it were printed with a different title page, indicating (falsely) that it was printed and (correctly) available for sale in New London, CT. In any case, I wonder what makes Lepore prefer Leeds' Almanack to Travis'. The reason that so little was printed in the colonies was that printers there could rarely compete against larger, more established and usually more skilled printers in England. Hence they specialized in publications with great local specificity -- almanacs, religious works by locally famous preachers such as the Mathers, and legal proclamations (including, in 1709, official proclamations of a day of thanksgiving :-). In other words: Lepore's list is a list of top 10 works printed in the colonies that year, not the top 10 works bought and/or read in the colonies. In the latter category, it seems safe to assume that the number one seller of 1709 was the bible (as it was almost every year back then). - Dryden's "The Indian emperor, or the conquest of Mexico by the Spaniards"
- Richard Steele's "The Christian Hero"
- a general collection of poetry "by the most eminent hands"
- and quite a bit more. 1. Richard Steele's periodical the Tatler, which first saw the light of day on April 12, 1709, and appeared for a total of 271 issues over the course of almost two years. This hugely influential thrice-weekly satirical magazine criticized such (aristocratic) vices as dueling and gambling, while promoting what its authors deemed virtuous behaviour. The paper had a clear political (Whig) agenda. Upon its demise, it was almost immediately replaced by Addison & Steele's even more famous The Spectator. Earlier this Fall, the New York Times ran a short story on the Tatler's present-day successor. 3. Francis Hauksbee's Physico-Mechanical Experiments On Various Subjects. Containing An Account of several Surprizing Phenomena touching Light and Electricity, Producible on the Attrition of Bodies. With many other Remarkable Appearances, not before observ’d. (Yes, early publishers were big fans of very lengthy titles, as these simultaneously served as precursors of the 'jacket blurb' books often come with today.) Hauksbee, a fellow of the Royal Society, was an acquaintance of Isaac Newton, who suggested some of his experiments. He is best known for his electrical experiments, some of which were essential to the development of neon lighting as well as mercury vapor lights (lights without electrodes). John Lawson's A New Voyage to Carolina, not published in the colonies, but very much about them, a key early work on the natural history of the Carolinas (and the American colonies more generally). Who speaks for the EU? Last week the Czech Republic became the last European Union member state to ratify the Lisbon Treaty. The next challenge was for national leaders to fill two key new positions created by the Treaty: a president and a high representative for foreign policy. The choices were made earlier today in Brussels: Belgium Prime Minister Herman Van Rompuy will become EU president, and the current EU Trade Commissioner, Britain's Catherine Ashton, will become the face of the EU's foreign policy. The New York Times article on these choices highlights commentary from those who are disappointed by the low political visibility of both choices. For a long time, Britain's Tony Blair was considered the front-runner for the presidency. However, Blair combines greater international standing with a more controversial political history (including support for the Iraq War), and proved to be unacceptable to a number of member states. While some disappointment may be understandable, there are reasons to be optimistic too. If one cares about the strength and unity of the EU, it is far from obvious that appointing a strong but intensely controversial person such as Blair to the presidency would have been a good idea. The history of the European Court of Justice may be instructive here. Few people can identify individual ECJ justices, but almost everyone agrees that it is the most powerful institution in the EU. In contrast, many people can identify Javier Solana, the former NATO Secretary-General who has been the EU's foreign policy czar for about a decade, but few argue that his international standing contributed a lot to the power of his position. Appointing major international figures to these two new positions would have risked shifting the emphasis from the position to the person, and surely that is the last thing the EU needs. On the whole, I like Malcolm Gladwell's work a lot. Both The Tipping Point and Blink were interesting and thought-provoking. While I thought Outliers was weaker, its overall message is even more important than that of the other two books. In Outliers, Gladwell makes clear just how much context matters to success later in life. The standard narrative of the American dream emphasizes hard work almost at the expense of other requirements (all people could pull themselves up by their own bootstraps if they only applied themselves). Most people, when pressed, acknowledge that talent cannot be ignored (it's hard to pull on bootstraps if you don't have any arms). Few people, however, are conscious of the importance of personal circumstances (what if you don't have any bootstraps?). For people opposed to distributive justice, that importance constitutes an uncomfortable truth. Throughout Outliers, it sometimes appears that Gladwell wants to claim that talent is comparatively unimportant (if you practice long and hard enough, and are given bootstraps, you can pull yourself up, with or without arms). That claim is implausible, but fortunately it is also not necessary for the deeper point (having bootstraps matters!) to hold. Gladwell's latest book is a collection of some of his articles written for the New Yorker. What the Dog Saw includes chapters on varieties of mustard, Ron Popeil (of "it slices, it dices" fame), fear vs. panic, intelligence reform, and much more. There is some thematic ordering to the essays, but no overall message. Steven Pinker's excellent but critical review of the book points out some of its shortcomings, which in many ways are shortcomings of Gladwell's work more generally, though they emerge in sharper relief in some of the individual essays. Although Pinker does not quite put it this way, two key weaknesses systematically undermine the power of Gladwell's conclusions. First, his understanding of what we know about the neurological, psychological, and sociological determinants of decision-making appears simplistic (evident also in Blink). Second, he mischaracterizes key insights/implications from statistics quite often (evident also in Outliers). Pinker amusingly characterizes Gladwell's failings as the "Igon Value Problem", after an error in the book which suggests Gladwell is not familiar with eigenvalues. Pinker implies that Gladwell simply does not understand psychology or statistics well enough to draw conclusions, but I am not convinced this is true. It seems more plausible to me that Gladwell's preference for unexpected insights and neat conclusions drives him to oversimplify issues; sometimes this merely results in a loss of nuance, but occasionally (probably too often, in fact) it actually leads him astray. The validity of Pinker's overall critique is underscored, I think, by the weakness of Gladwell's reply to it, which focuses not on Pinker's general argument, but rather on one small empirical claim Pinker uses to buttress his argument. President Obama is visiting South Korea at the moment. Today he announced that he will send an envoy to North Korea to discuss that country's nuclear program. These days, when North Korea hits the news it is usually because of its nuclear policy (including the development of nuclear weapons). However, it is worth remembering that North Korea is also one of the worst governments on earth (quite possibly the worst) in terms of taking care of its citizens. A disastrous famine ravaged the country in the late 1990s. By most estimates, at least half a million people died of starvation, and maybe two million more died prematurely. The famine was ended only thanks to foreign food aid (in particular from the UN's World Food Programme). Two weeks ago the New Yorker published an article by Barbara Demick which offered a searing account from a survivor of the famine, who has since escaped to South Korea. Highly recommended reading! (Only the abstract is still available at the New Yorker's website; the full article is available to subscribers, or electronically from most university libraries). Renewed food shortages have arisen in the past two years (for 2008, see coverage in the Washington Post and Time magazine). These are caused in part by cuts in food aid in retaliation for North Korea's nuclear tests, most recently in May. However, since the North Korean government has proven it does not much care if its subjects live or die, the rationale for such sanctions is unclear. Who opposes healthcare reform, and why? Two interesting op-ed articles about healthcare in the New York Times today. One, by Nicholas Kristof, draws parallels between the current healthcare debate, the Medicare debate 40 years ago, and the Social Security debate 30 years before that. Kristof makes clear just how similar (and how devoid of reality) the arguments opposing each policy innovation have been. The second article, by Gelman, Silver, and Lee, notes that a legislator's support for or opposition to "Obamacare" appears to be driven more by their constituents' support for or opposition to Obama than by whether or not these same constituents actually support healthcare reform. In other words (and unfortunately so): legislators care about politics more than policy. German, Silver, and Lee also provide a very telling chart of support for healthcare reform, by state, age, and income level. This chart makes clear just how important economic self-interest is to public opinion on healthcare reform. Those who are below retirement age and earn less than $40,000/year are more likely to support reform, on average (and the poorest are the most likely to do so), whereas those over 65 (who are eligible for Medicare) or who make more than $70,000/year (most of whom are probably insured through work, and who in any case are better able to afford basic preventive care) are less likely to support reform, with the richest and oldest are least likely to do so. It is striking how consistent this pattern is across states, although some regional differences do remain. Mebrahtom (Meb) Keflezighi won the NYC marathon last Sunday, a great and well-deserved victory, and the first for an American citizen since 1982. It will not surprise those who follow distance running closely that debates immediately broke out on running bulletin boards as to how "American" Meb really is. The New York Times has a good article reviewing some of the arguments. Meb was not born in the U.S. — he immigrated at age 12. But he has been a U.S. citizen for years, and is a product of U.S. running programs (high school, college, post-collegiate). Personally, I am convinced that the real reason some people discount his American-ness is racial, not the fact that he was born elsewhere (after all, Frank Shorter was born in Munich). However, the point of this post is not to take issue with anonymous message board contributors spouting their ill-informed and ill-formed opinions. Instead, I want to look more closely at the "contribution" to the debate by CNBC's sports business reporter Darren Rovell. Rovell wrote an online reaction to Meb's win titled "Marathon's Headline Win Is Empty". Why did Rovell think it was empty? Because "the fact that he's not American-born takes away from the magnitude of the achievement the headline implies": "he's like a ringer who you hire to work a couple hours at your office so that you can win the executive softball league." So what did Rovell know about Meb? Apparently only that he was born elsewhere, as we shall see below. So what does a good reporter do to learn more? Nothing, it seems. And what did Rovell conclude based on his "knowledge"? That Meb is essentially a ringer, someone with an unfair advantage. How can one conclude this? There appear to be only three ways. The first is explicit in the article, the second and third are implicit. 1. Meb is not "really" American because he is inspired by the motivation of prize money equivalent to "a lifetime full of riches" for a poor African. This argument logically fails, since as Rovell could not help but notice, Meb actually lives "in our country", where his marathon winnings do not constitute a lifetime of riches. 2. He is not "really" American because his formative years, and the decision to become a professional runner, took place in Africa, where the lure of prize money does come into play. 3. He is not "really" American because he is genetically African, which offers an unfair advantage. This obviously, implies a racist understanding of what it means to be American. "I didn't account for the fact that virtually all of Keflezighi's running experience came as a US citizen. I never said he didn't deserve to be called American. All I was saying was that we should celebrate an American marathon champion who has completely been brought up through the American system. This is where, I must admit, my critics made their best point. It turns out, Keflezighi moved to the United States in time to develop at every level in America." • Rovell did not explicitly say that Meb did not deserve to be called American, but he did say that he was unwilling to "break out my red, white and blue" for him. • He did not say that we should only celebrate someone who has completely been brought up through the American system. Indeed, he did not mention the American system at all. Why, then, suddenly refer to the American system now? Because it allows him to claim that he was putting forward argument 2 above, not argument 3. But this raises another, equally uncomfortable point. Rovell is identified as a "reporter" on CNBC's website, not a bloviator. His bio is all about the "reporting" he does. Yet apparently this "reporter" did not bother to check even the most trivially accessible information about Meb: the age at which he came to the U.S., and his running resume. Why not, if this was really the key to his argument, as he tries to claim in his follow-up piece? We can draw one of two logical conclusions: a) Rovell does not deserve to be called a reporter; b) Rovell is, in fact, a racist. Or, perhaps better for Rovell but worse for the quality of our media, a third conclusion: many reporters nowadays believe (correctly?) that they can forego actual reporting and even fact-checking with impunity. In recent weeks, there has been some debate here in Athens about the safety of raw milk. Two weeks ago, I wrote a letter to the Flagpole weekly, in reply to some fear-mongering on the issue which used false, misleading, and unverifiable statistics. One of the "facts" I took issue with was the claim that the CDC has reported that from 1998 to 2005, one thousand people fell ill from consuming unpasteurized milk, and two died. As I pointed out in my response, the former figure appears plausible, but the CDC's published statistics offer no indication that two people died from consuming raw milk during that period. The only deaths due to milk consumption the CDC does report are three deaths due to the consumption of pasteurized milk, in 2007 — the epitome of an "inconvenient truth" for those who wish to attack unpasteurized milk. After some additional research, I found that the claim about 1000 illnesses (actually, the "correct" figure is 1007) and 2 deaths pops up everywhere, including in official documents. Indeed, the FDA offers it in its rather fear-mongering Q&A article on raw milk without offering any attribution other than to mention the CDC. The FDA's document claims the following: "The Centers for Disease Control and Prevention (CDC) reported that from 1998 to 2005, there were 45 outbreaks of foodborne illness in which unpasteurized milk or cheese likely made from unpasteurized milk were implicated. These outbreaks accounted for 1007 illnesses and 104 hospitalizations, and two deaths. The actual number of illnesses is almost certainly higher, but not all cases recognized are reported." This claim, or parts of it, is widely copied in other articles (a Google search on the string "1007 illnesses, 104 hospitalizations" gives 884 hits), usually verbatim, and rarely with reference to the original source. Further digging indicates that the FDA did at one point offer an actual source for the claim, in a March 1, 2007 press release. There, they refer to the March 2, 2007 issue of the CDC's Morbidity and Mortality Weekly Report (MMWR) 56(8):165-167. This report is easily downloadable from the CDC website, and it does not support the FDA's claim. Instead, it notes that over the period 1998-2005, just 33 (not 45!) outbreaks were reported, without specifying anything about number of illnesses or deaths. In turn, the MMWR simply refers readers to the CDC's annual listings which, as I noted, do not indicate any deaths. Why, do people — and not just random blog posters; the National Environmental Health Association does it too — misleadingly cite this report for a claim which it does not support? Presumably because citing a source makes a claim seem more authoritative, and they cannot be bothered actually to double-check whether that source supports their claim. The FDA surely knew that the citation was false, but probably assumed — correctly — that most people would not double-check. Still further digging shows that the MMWR of of November 9, 2007 (56(44):1161-1164) does offer the claim the FDA already announced in March. Here we find the statement: "During 1998--2005, a total of 45 outbreaks of foodborne illness were reported to CDC in which unpasteurized milk (or cheese suspected to have been made from unpasteurized milk) was implicated. These outbreaks accounted for 1,007 illnesses, 104 hospitalizations, and two deaths (CDC, unpublished data, 2007)." Note that they refer to unpublished data (and that the blame is spread to cheese, something most of those who use the claim ignore). Indeed, this data appears never to have been published. That is puzzling, since it obviously contradicts published data (as well as the figure of 33 outbreaks offered in the same publication just a few months earlier). The most likely explanation is that further research showed the data to be unverifiable or faulty. The fact that the claim is offered in an "editorial note" rather than in an actual research report is, perhaps, telling. Why, then, does the FDA continue to use this claim in its official information? Because it is convenient for the story they wish to tell, one imagines. But their doing so is disingenuous at best, and it permits others to get away with offering misinformation simply by appealing to the "authority" of the FDA, a government agency. Indeed, numerous online sources simply copy the November MMWR claim, again usually without attribution, down to the mysterious (and utterly unhelpful) citation to "(CDC, unpublished data, 2007)". Even a presumably peer-reviewed article in the journal Food Microbiology (26(6):615-622) gets away with doing so, despite the fact that none of the authors was associated with the CDC, so they obviously had no access to that data, and they do not indicate where they got the figures (probably the FDA press release). Given how easy it is to access the alleged sources of these claims, it is disappointing how rarely people actually do so. Data offered without a source is unverifiable and hence worthless, so one should always cite sources. Moreover, the point of citing a source is not to look intelligent or well-read; it is to offer your readers the opportunity to learn more and/or to verify that you are right. At a minimum, then, you should make sure that they will actually find what you claim they will. Much has been written recently about the threat posed to the traditional (print) media by blogs. Michael Massing has a good article in the New York Review of Books. It's not optimistic about the prospect for traditional quality newspapers such as the New York Times: some serious changes are likely. But Massing has more confidence in the survival of investigative journalism than do many other observers. Another intriguing and relatively optimistic analysis is offered by Steven Johnson here. I hope the optimists are right, and I find Johnson's arguments convincing on the whole. However, neither Massing nor Johnson quite grapples with one of the most problematic issues: how does one distinguish reporting from echoing? Or, more problematically: how will the average consumer know where to look for the former, and how to distinguish it from the latter? I am less worried about the actual disappearance of sources of quality information than about their drowning in a sea of misinformation. It is my impression, though I hope I'm wrong, that the factual quality of contemporary debate has been deteriorating. It is easier to be confident of a falsehood if one sees it repeated many times, and the web contains almost any falsehood many times over. As Mao already suggested: "A lie, repeated a hundred times, becomes the truth". A few weeks ago Doonesbury had a funny (scary?) cartoon related to this concern (hope this link still works) discussing American gullibility. In the cartoon, a researcher on conspiracy theories identifies "reasonists" as a tiny group of people, not very influential, who believe in an evidence-based world. Minor preface to my next post about the future of printed media: UGA's student newspaper, the Red and Black, does not give one high hopes for the newspaper industry. The frequency with which spelling errors and grammatical mistakes appear in its pages is roughly equal to what one might expect from a hastily written blog entry. Apparently they do not believe in copy-editing. As the latest case in point, today's front page feature story is about senior tennis player Christian Vitulli. Yet the headline in the printed version of the paper refers to him as Vatulli. Although this has been corrected in the online version, the article itself manages to refer to him as both Vitulli and Vutilli, an error still present in the online version as well. That's three different spellings for the last name of the subject of the feature story of the day, in an article no more than a few hundred words long. Did Europe made Africans genocidal? The Darfur conflict has now been around long enough for a second wave of books on the subject to begin appearing with — one hopes — more nuanced, theoretically informed analysis than earlier books, which were largely descriptive. Most prominent in this second wave, so far, has been Mahmood Mamdani's Saviors and Survivors, published earlier this year, and reviewed quite positively in the New York Times back in March. Unfortunately, Mamdani's book is longer on ideologically motivated claims than it is on analysis. The NYT review already hinted at this weakness, noting that "Mamdani’s constant refrain is that the virtuous indignation he thinks he detects in those who shout loudest about Darfur is no substitute for greater understanding" [emphasis mine]. An excellent — and scathing — review of Mamdani's book by Richard Just which appeared in The New Republic in September makes clear that Mamdani's own virtuous indignation is no less ill-informed than that of the humanitarian actors he attacks. An earlier review by Nicholas Kristof, in the New York Review of Books, was similarly critical. Both reviews are well worth reading. One important weakness of the book which emerges only partially from either of these reviews concerns Mamdani's argument that genocide would not have happened but for racial policies implemented by the colonial rulers: Britain, in the case of Sudan; Belgium, in the case of Rwanda. Mamdani reiterates this point in his response to Kristof's review (a response which nitpicks, but does almost nothing to rebut the overall content of Kristof's critique). The argument itself is hardly controversial, and it is not unreasonable for Mamdani to call attention to often-overlooked historical roots of present-day problems. What is problematic is the implicit hint that the slaughter in Darfur is somehow Britain's fault (and the genocide in Rwanda Belgium's fault). This fatally confuses necessary and sufficient conditions. Genocide (or mass slaughter) is always a policy choice. The fact that it is a policy choice that would not have been on the radar screen of the Sudanese government but for colonial legacies left by the British does not make it any less of a reprehensible choice, or the result less of a crime against humanity. To argue otherwise — to claim that somehow the Sudanese government is not to blame for its policies — is a worse example of neocolonial attitude than anything Mamdani can indict the Save Darfur movement for. It suggests that Africans (the Sudanese in this case) have no independent agency: they cannot come up with policies on their own, but instead simply continue to reproduce the policy ideas left to them by the British decades ago. Interesting op-ed article in the New York Times earlier this week: "To Catch a Looter". Roger Atwood points out that it is easier (and cheaper) than one might think to prevent the looting and illegal export of historical treasures. Successfully keeping such treasures in their original location makes possible archeological tourism, which can greatly benefit the development and living standard of local populations. One could argue, therefore, that the prevention of looting qualifies as a policy that can be supported on grounds of international distributive justice, not just out of an interest in art history and archeology. Local authorities might play up this added moral justification as a way to increase their ability to attract external funding for the protection of their own heritage. Two separate New York Times columnists have raised the connection between education and inequality in recent days. Ross Douthat's main point was that Democrats would be unable to stem a tide of rising inequality, and that although this is not their fault, it will nevertheless undermine the credibility of liberalism because liberals have argued the conservatives were to blame for the rising inequality. 1. If conservative policies contribute to rising inequality, it does not logically follow that a change in government will end this effect: policies, once implemented, can continue to have an impact for a long time. 2. If the Democratic Party-led government puts into effect policies to counteract these existing policies, it does not logically follow that inequality must stop rising: many other factors influence inequality. 3. There is a big difference between some people arguing that conservative policies contribute to rising inequality and concluding that the entire Democratic Party does so. 4. It is even less valid to make the same kind of jump to implicate all of "contemporary liberalism". 1. "Federal income tax is already quite progressive" (hence making it more so will matter little). In fact, according to the OECD, the U.S. ranked just 21st among OECD countries in terms of top marginal income tax rate. Its ranking differs on other measures, but none that I am aware of justify the conclusion that U.S. federal income tax is "quite progressive". 2. "Inequality is driven in part by low-skilled immigration"
True, but the available evidence suggests that "immigration accounts for a small share (5%) of the increase in U.S. wage inequality between 1980 and 2000." 3. "Immigrants... are taking longer to achieve upward mobility than earlier generations did." 4. "Inequality is perpetuated by our failing education system — and especially by the bloated cartel responsible for educating the nation’s poorest children"
The second part of this claim is pointlessly tendentious. Obviously there is no single cartel responsible for educating the nation's poorest children. It is true that several different (but not all!) teachers' unions have made educational reforms needlessly difficult. But it does not follow that they are primarily responsible for perpetuating inequality. Numerous other factors contribute far more to problems with the public school system: de facto segregation, funding, etc. (See, for example, some of Jonathan Kozol's excellent reporting; also in book form.) In other words, Douthat is taking the same kind of cheap shot at teachers' unions as he does at low-skilled immigration: yes, these are contributing factors, but they are far from decisive. Nicholas Kristof focuses more specifically, and also more thoughtfully, on teachers' unions. Among others, he refers to an excellent, but also very discouraging, recent New Yorker article on the difficulty of firing incompetent teachers in New York City. This article makes clear that the teachers' union is not doing itself any favors; indeed, their behavior explains why people like Douthat often jump to unfair conclusions regarding the union's share of the blame for poorly performing schools. Much recent research has shown that the quality of teachers is more important than class size, spending per student, or other factors. It thus follows that resistance by the unions to the firing of incompetent teachers makes matters worse. But it does not logically follow that if only the unions would get out of the way things would magically get better, without having to do anything else. Blaming the unions is an easy way to avoid having to face more difficult problems. How, after all, does one attract good teachers? Offer them good salaries, reasonable-size classes, functioning equipment, a good support staff, a school building in good repair, etc. All of that, of course, requires money. Research shows clearly that funding alone is not enough: there has to be more of an emphasis on teacher quality. On the other hand, it is ludicrous to pretend that there is some vast army of very good teachers who are just chomping at the bit to build a career in overcrowded, underfunded, run-down public schools, for a low salary, and who are being prevented from doing so only by recalcitrant unions. It's been a while since I updated this blog, but it's about time I get it going again. So, as a first comment, something about an issue that is crucial to much of the current healthcare debate, but is unfortunately rarely made explicit. About a month ago, the College Republicans at UGA invited two doctors to speak on healthcare. These physicians claimed to offer "an evidence-based approach" to opposing health care reform. Most of this evidence is recapitulated on their blog (whose sub-title suggests that they do not know the difference between "ills" and "ails": not a good sign!). Their argument against reform appears to be that 1) any statistics which indicate the U.S. healthcare system performs poorly are wrong, while statistics that indicate it performs well are correct; 2) access to healthcare is not a problem (there is always the ER), and 3) the Massachusetts healthcare reform has worked very poorly, so U.S.-wide reform will fail. Although they claim to base their arguments on evidence, their reading of this evidence is highly selective and obviously geared to support their predetermined conclusion. More disturbing is their take-away message, as reported in UGA's student newspaper, the Red & Black: they consider it "common sense" that "If we are going to bring 47 million people into the system without increasing the number of doctors out there" this will "give you less access". And there's the rub: Theirs is an argument of "haves" versus "have-nots". At its heart, this is not an argument about efficiency or cost, nor even about access. Of course, one can debate whether or not healthcare reform might bring new doctors into the system (though they do not address this question), whether physicians are the limiting factor in access to healthcare (also not addressed), and whether "less access" implies worse care (also not addressed). But abstracting away from those questions, these two doctors apparently consider it "common sense" that those who benefit from the current system (doctors and well-insured patients alike), a system which is heavily subsidized by the government (about half of all healthcare spending in the U.S. is public spending), ought to oppose extending similar government-subsidized benefits to those who are currently excluded. This is a question of distributive justice. It is about the justice of maintaining an institutional structure which excludes certain people from receiving benefits (subsidized by the government) in a way that is manifestly inequitable (see Nicholas Kristof's column in the New York Times last week; more systematic detail is in this academic study); an exclusion that, among others, results in an estimated 45,000 unnecessary deaths per year. Even if it were true that the "you" the doctors addressed in their talk can expect to encounter "less access" under a reformed healthcare system, which is highly debatable, is it too much to hope that many of them would be willing to offer up a little access in exchange for saving the lives of up to 45,000 fellow-citizens per year? P.S. Interestingly, the Red & Black recently reported that quite a few UGA undergraduates are without health insurance. Of course, it is possible that those without health insurance are less likely to attend an event organized by the College Republicans, and thus were not part of the "you" the doctors were addressing. 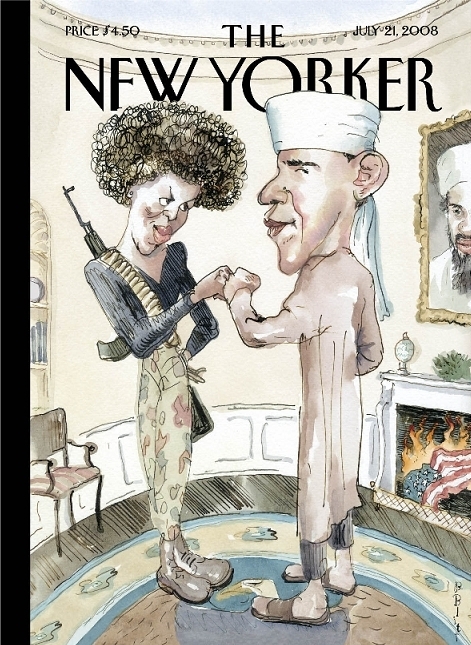 The January 26th New Yorker featured Obama on its cover, made up to look like George Washington. They are offering free copies of the cover to those registering on their website, here. It is not easy to find a reproduction of the cover on the New Yorker's own website (they've moved on to the next issue already) but you can see it here. It is a dignified illustration, but not one of their better covers, IMHO. I suspect both the muted nature of the cover and the offer of free commemorative copies are intended, at least in part, to make Obama's camp forgive and forget the minor dust-up this past summer over the July, 21st cover by Barry Blitt. That cover satirized some of the more overblown right-wing conspiracy theories about Obama's character by depicting him in the Oval Office, with a picture of Osama bin Laden on the wall, the American flag in the fireplace, and Michelle channeling Angela Davis. The illustration, titled "the politics of fear", was judged "tasteless and offensive" by an Obama campaign spokesman, and the McCain campaign agreed. The Huffington Post at the time ran a brief interview with New Yorker editor David Remnick in which he offers a bit of context, but one gets a sense that he is mostly frustrated by the number of people who apparently insisted on misinterpreting the cover. Indeed, an interesting, though somewhat meandering, essay on the fracas by DB Dowd points out that to be offended one would need to be both culturally clueless and visually illiterate. 2) people are worried that many other people are, in fact, culturally clueless and visually illiterate, and thus will not realize that the cover is satirical. reactions to the cover at the time suggest that they are at least partially right. In light of this, perhaps the rather anodyne inauguration cover was a wise choice. Still, Mad Magazine's inauguration cover, spoofing general talk about what Obama might be able to achieve in his first 100 days, is rather funnier. The year-end issue of the Economist offered an overview of some recent work in the burgeoning field of evolutionary social science, i.e. the inquiry into possible evolutionary roots of human social, economic, and political behaviour. The article is titled "Why we are, as we are", and primarily reviews studies that highlight "Darwinian answers to social questions", i.e. different ways in which the evolutionary drive to reproduce may translate into observed patterns of human behaviour. The article is interesting though also a bit simplistic. More importantly (and problematically), as my favourite evolutionary biologist points out: most of the findings discussed in the article lean rather heavily on the assumption that "correlation probably implies causation". For example, the article suggests that the growing income gap between men and women as they get older may be related to the fact that older women feel less of a need to show off to catch a mate, and may care more about security and working conditions. Fair enough, this may be part of the explanation. But the fact that women may care more about security does not mean they are not experiencing gender-based discrimination in the workplace. After all, this particular "finding" downplays the fact that there have been dramatic reductions (in some places and among some groups) in the gender pay gap over the past century. This is hardly long enough for meaningful evolutionary change among humans on this issue, leaving discrimination as the rather more obvious explanation. To hint that all (or even most) of the remaining gap is evolutionarily determined seems willfully (even disingenuously) naive. 2) that, as a result, one-size-fits-all policies aimed at redressing the gap will probably fail. 1) A gap that is smaller than it might seem at first sight (and shrinking) may still be sizeable and, for those on the "receiving" end of the gap, of great importance. Some interesting recent articles about the euro zone. The Economist, in its January 3rd issue, calls the euro "Demonstrably durable", arguing that it provides a crucial haven in financial storms, even though it may no longer afford euro-zone countries the ability to postpone painful reforms. The New York Times, on January 23rd, strikes a similar note, albeit with a different emphasis. Declaring that "For some in Euro zone, dream turns nightmarish", Landon Thomas suggests that some of the weaker euro states, such as Greece or Italy, "may be forced to declare bankruptcy or abandon the currency." Meanwhile, on January 1st, Slovakia became the latest European Union member to join the euro area. Finally, though it is not even a member of the European Union, "Iceland considers adopting the euro", as Reuters pointed out at the end of November last year. 2009 is shaping up to be an intriguing year for the euro. The UN as a nuclear power? The January-February 2009 of the Harvard Magazine has an interesting article on the role of habeas corpus in the war on terrorism as it is being fought by the U.S. government. The article is by Jonathan Shaw and is titled "The War & the Writ: Habeas Corpus and Security in an Age of Terrorism." The story of the Uighur detainees who have given up hope of ever leaving Guantanamo even though nobody even thinks they constitute (or ever constituted) a terrorist threat is particularly depressing. The January 5, 2009 issue of the New Yorker has an excellent article about life on the front lines of a humanitarian emergency, by Jonathan Harr: Lives of the Saints. It gives a good sense both of the difficulties of the situation in Chad, on the border with Darfur (Sudan) and of the risks and challenges to which humanitarian workers are continually exposed, whether they report to the UN or to a non-governmental organization such as Doctors without Borders. Highly recommended.